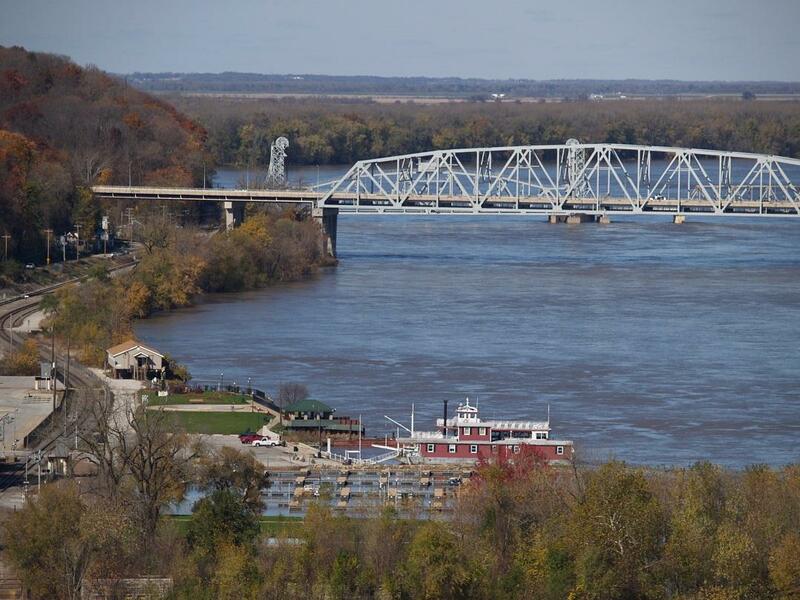 Telephoto photo taken from "Lovers Leap," looking up river, north towards the Mark Twain Memorial highway bridge that in 2000 replaced the original 1936 bridge that bore the same name. Behind the highway bridge in the distance is the Wabash railroad bridge which originally had a swing span to permit river traffic to pass beneath it. In 1994 the swing span was replaced with an elevated span that now performs the service. Taken in October, 2005 with a telephoto lens looking East from the same bluff a short distance south of "Lovers Leap." 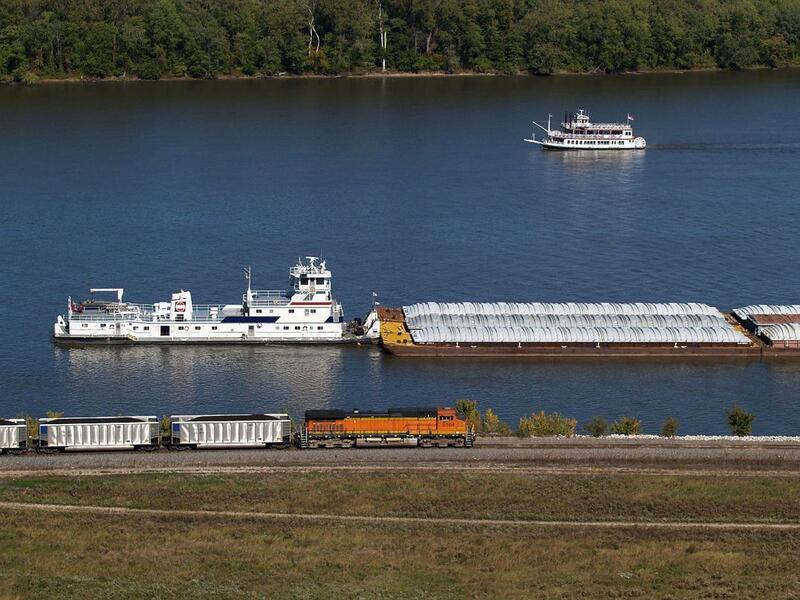 On top is the densely wooded Illinois shore and below that on the Mississippi river is the local excursion boat MARK TWAIN; close to the Missouri shore a big towboat pushes covered barges and in the foreground a diesel locomotive pulls freight cars loaded with coal. 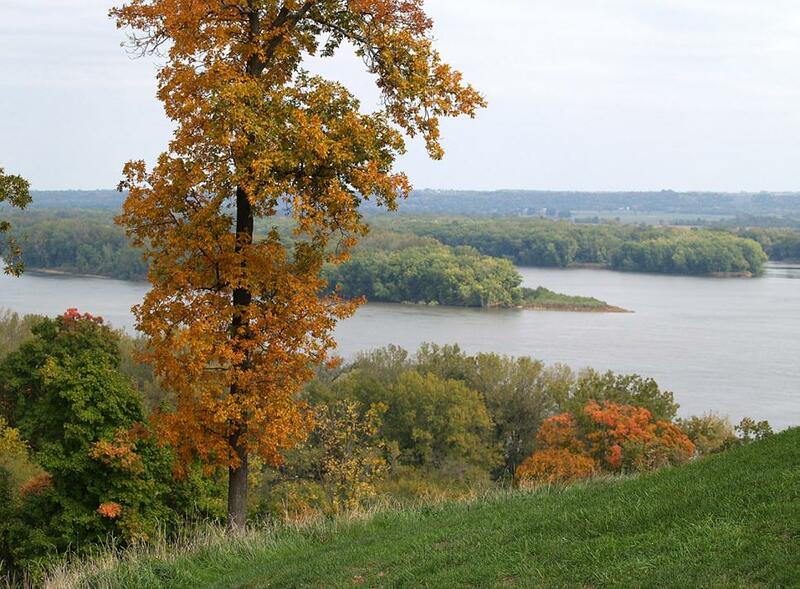 The view of islands in the river north of town was taken from Orchard Point, Hannibal's most exclusive residential neighborhood. The Wabash railroad bridge which originally had a swing span to permit river traffic to pass beneath it. In 1994 the swing span was replaced with an elevated span that performs the same service. 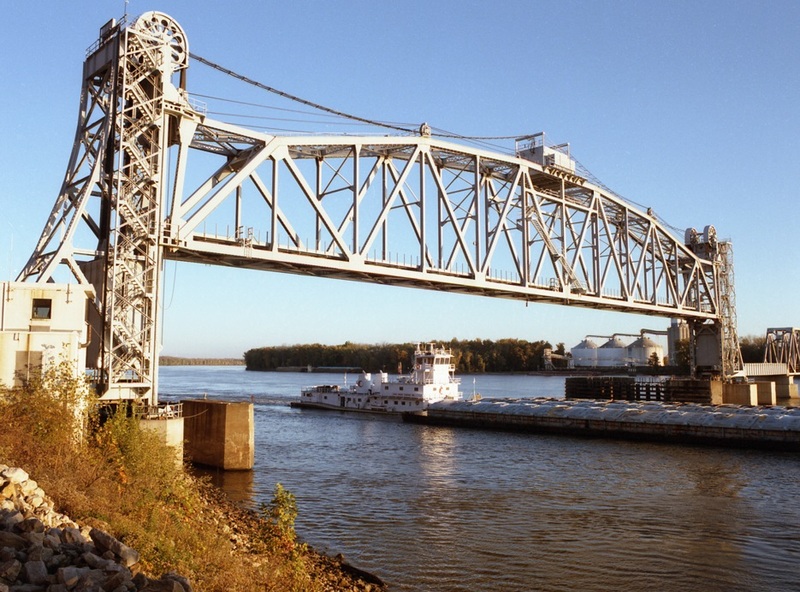 I took this photo in the late '90's while the elevated span was raised to permit a towboat to pass downriver under it. Third photo with glorious fall color was taken shortly after dawn in October during mid '90's from the old River Road. 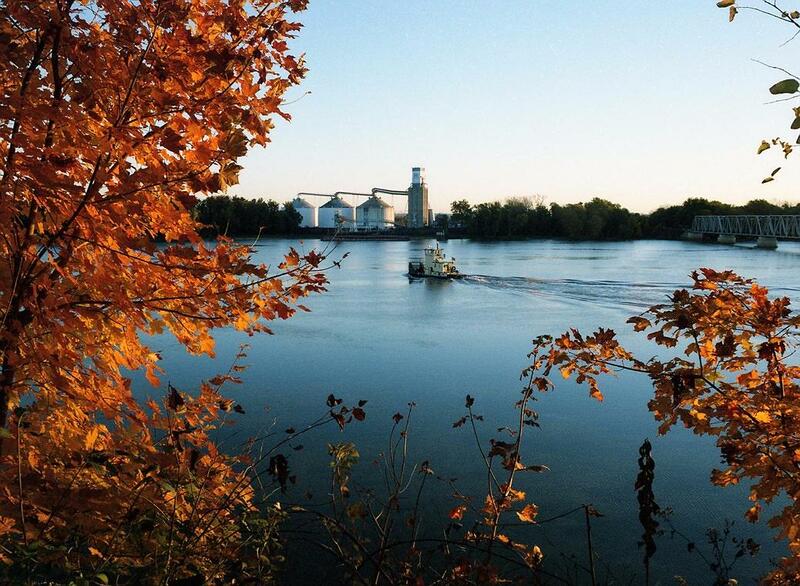 Across the river are BUNGE's grain silos on the Illinois shore and local towboat SIR RANDALL moving upstream above the railroad bridge which can be seen on the far right. Attached riverscape photo I took from the Missouri shore in Oct 2005 along mile-long Ziegler Chute looking northeast with mile-long Ziegler Island across the way. 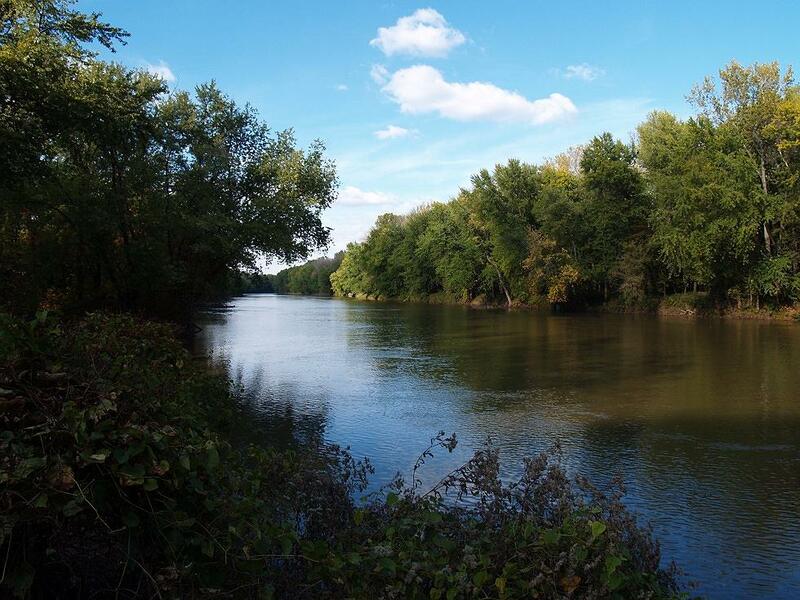 As you can see the chute is as wide as many rivers but it's only a fraction as wide as the Mississippi in which it begins and then flows back into. Have been wondering if the channel is deep enough for a steamboat. I forgot to ask Curt Lees if he would take us up Ziegler Chute and out into the river a mile above Scipio where he lived. 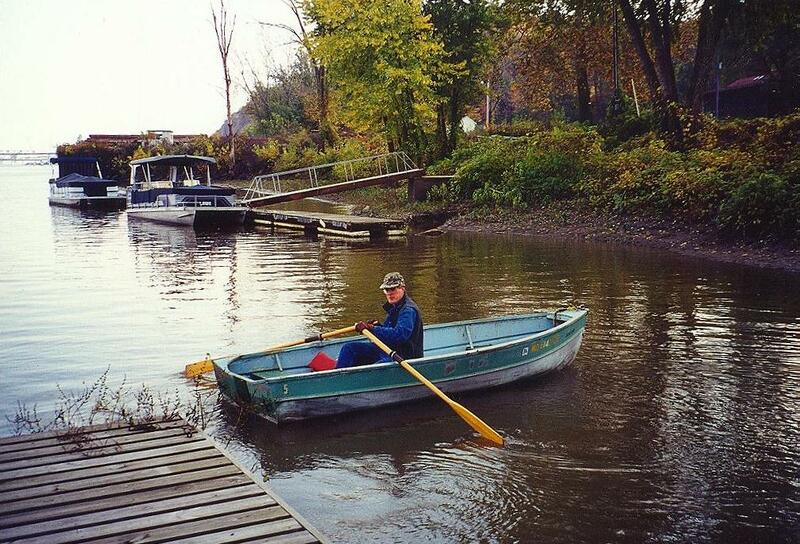 Should be deep enough for his pontoon boat and maybe the Hannibal excursion boat MARK TWAIN. Also attached photo of me with Curt & Ann's dog Fancy aboard their pontoon boat on the Mississippi. I took the photo of Fancy saluting with her left paw while we were walking down the river road from Scipio to Hannibal. We stopped and I kept talking to her and repeating her name and finally she raised her paw, perhaps saying "Enough already!" Fancy enjoyed those long walks along the road and up into Riverview Park and on Turtle Island out in the middle of the river. 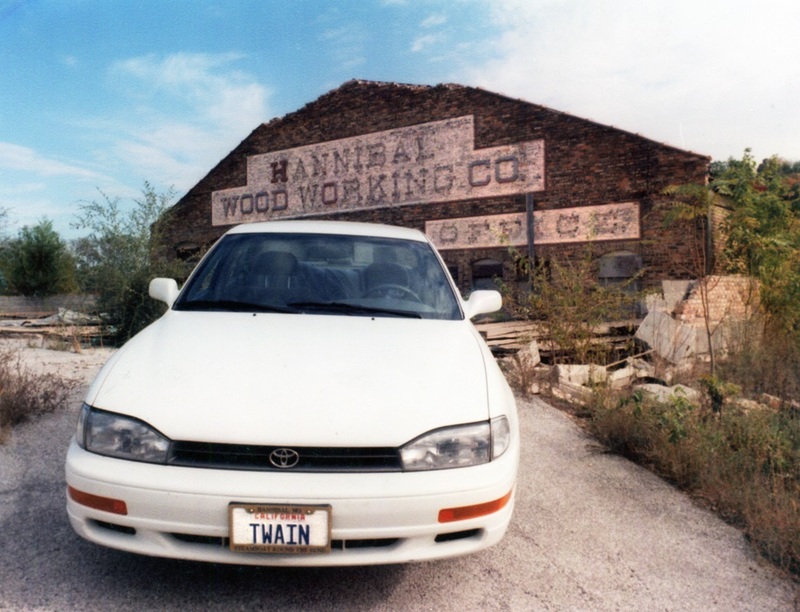 During the late '90's I took this of my Camry with its personalized TWAIN plate in front of the old Hannibal Woodworking building on a street that runs parallel to Bear Creek along the southern edge of town. 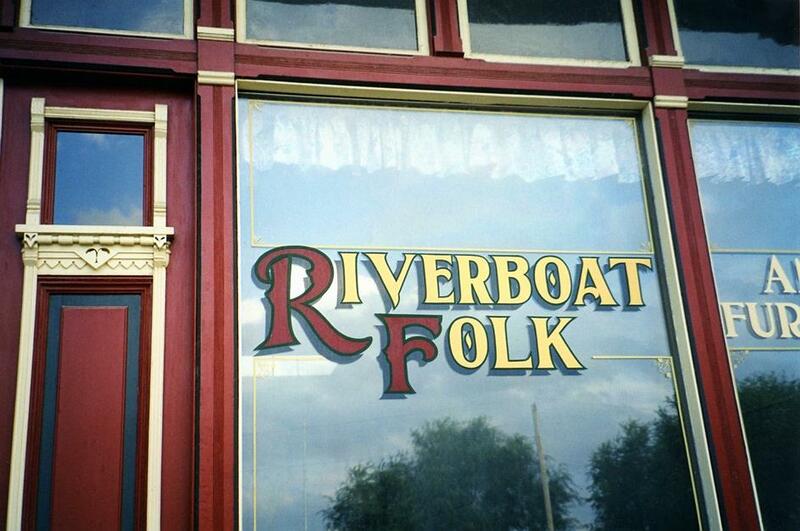 "Riverboat Folk" lettering on store front window. I took this on South Main Street in Hannibal some years ago. RIVERBOAT FOLK was devoted to furniture and interior decorating. This locale looks like it was in the vicinity of where the Hannibal Arts Council has its gallery now. 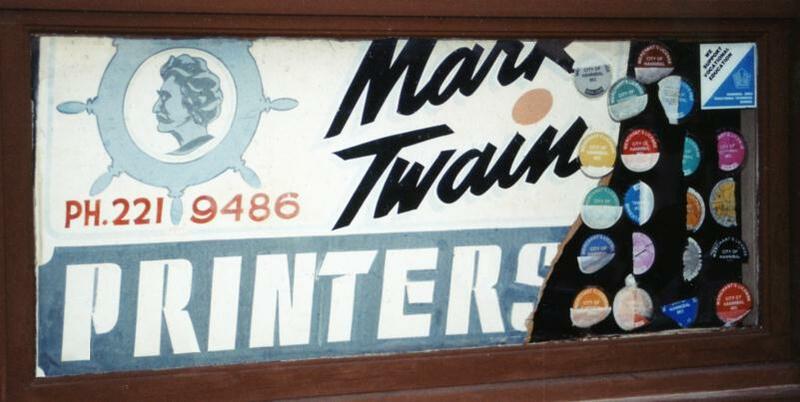 Vintage "Mark Twain Printers" sign silk screened on masonite in the window of a small one story brick building on Main Street in South Hannibal, on the other side of Bear Creek from the main business district of Hannibal, Missouri during the 1990's. The right quarter of the sign seemed to have been roughly broken off and in the ragged void left behind are 20 annual Hannibal circular Merchant's License stickers. Sam Clemens began working as a "Printer's Devil" on the Hannibal Courier newspaper further north up Main Street in 1848 so the "Printer's business" being called after his pen name was appropriate. Haven't seen the sign at that location in many years now so the enterprise doesn't seem to be there anymore. 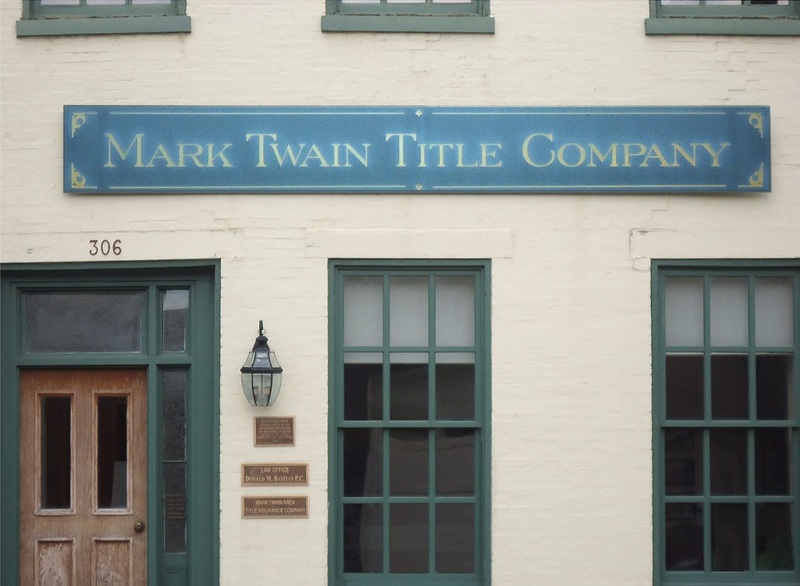 The MARK TWAIN TITLE COMPANY's beautiful sign on the Benjamin Horr House is a historic home located at Hannibal, Marion County, Missouri. The sign had faded so I enhanced and increased contrast to made it more readable in this photo that I took in 2010. The two-story, vernacular Greek Revival style brick structure was built about 1855, two years after Sam Clemens had left town. It has a front gable roof with cornice. It was added to the National Register of Historic Places in 1986. Elizabeth Horr, Benjamin's wife, ran a school in Hannibal at this location during the 1840's which Sam Clemens attended. 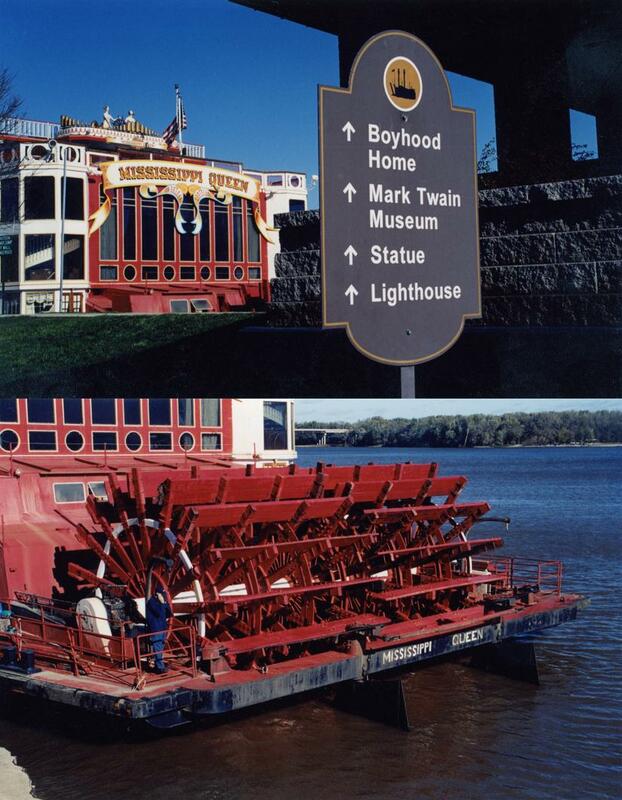 Attached 2 photos I took during the 1990's of the MISSISSIPPI QUEEN's stern where she sat moored on the Mississippi River at Hannibal, Missouri with a sign to local tourist attractions. 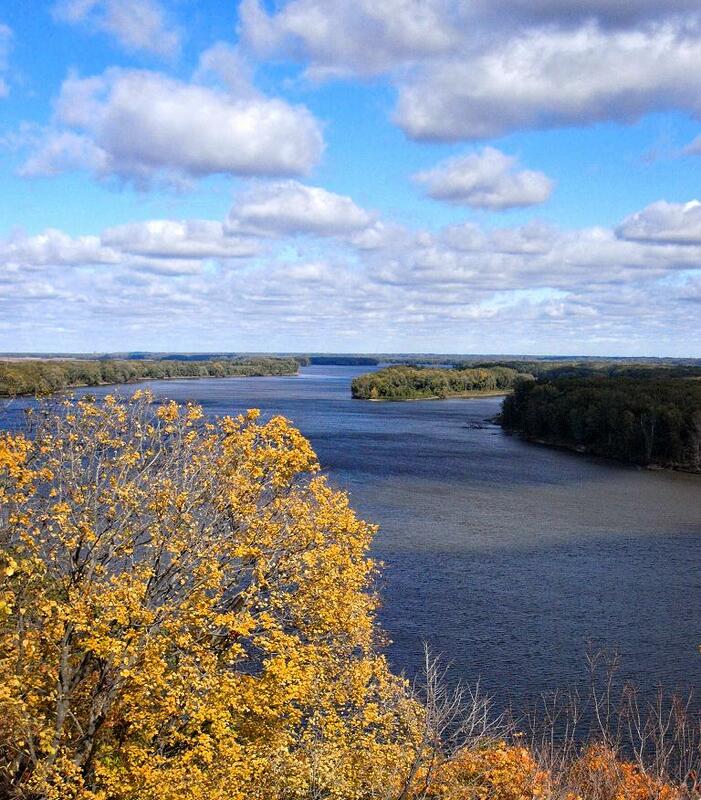 Looking upriver from Riverview Park where the bigger than life bronze of Mark Twain stands on a marble pedestal wearing a statesman like overcoat and looking out at the Mississippi and Turtle Island. Great day for clouds when I took this, love the skies and often when there aren't any clouds the sky is usually a much deeper blue than I see in California.